I was in a lesson with a teenage student when I saw they were writing down the lyrics to a new song using an app. Within the app she was able to look up rhyming words, synonyms, antonyms, download beats, and more. I was really excited by the idea of this app and had to share it with you all! I have not personally used it, but it looks really interesting! The App is called MOGUL and is for the iPhone and iPad. 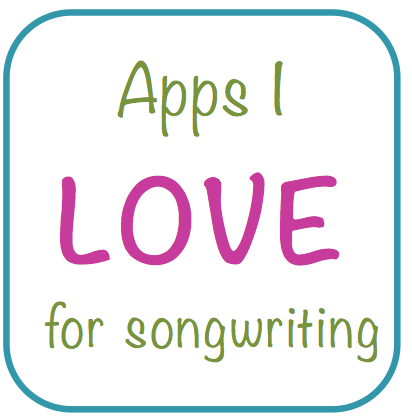 MOGUL is a simple to use, yet fully featured songwriting app. Songwriter’s can use the built in reference tools to define words and find rhymes, synonyms and antonyms. Words can be collected and saved in an idea bank for later use. It allows users to create and store all of their lyrics in one place and for the serious songwriter it provides the ability to easily search and sort through hundreds of documents. MOGUL comes equipped with three vocal tracks for recording audio and one beat track for playback. Singers can buy, download or import beats from within MOGUL for use as backing tracks when recording vocals. Each track has its own volume fader allowing users to get the proper mix before bouncing and sharing the finished song. MOGUL is powered by Makehitmusic.com, an online royalty free music catalog that includes more than 25,000 Beat Tracks(TM) by some of the hottest music producers from around the globe. Beat Tracks(TM) are available in the popular Hip Hop, Pop and R&B genres and are fully composed instrumentals ready to be used in the studio. Such variety makes it is easy for artists to find and license the perfect beat, add vocals and make hit music! With this release of MOGUL 1.0 only a dozen beat track titles are available for in app purchases or free downloads, but hundreds more will be added in the coming weeks. Artists can publish their hits to the built in Mogul Zone community to build a fan base and become the ultimate Mogul! Completed songs can be published to SoundCloud and can then be shared on Facebook and Twitter. iCloud integration allows artists to start projects on the iPhone and continue seamlessly on the iPad or vice versa. “MOGUL was designed with the Hip Hop artist in mind. It is an all in one workstation for iPhone and iPad that allows singers to import beats, write lyrics, record vocals and make hit music!” says Moore. MOGUL 1.0 is being offered at an introductory price of $2.99, Over 70% off of its regular price of $9.99 USD (or equivalent amount in other currencies) and is available worldwide exclusively through the App Store in the Music category. If you would like more information about MOGUL or would like to schedule an interview with Mr. Moore, please send an email request.